Ready your funny bones; ahead of Olivier Award-nominated The Comedy About A Bank Robbery‘s second West End birthday, the show has announced it’s snagged a new company to take over the heist from 27 February. Following a year of good behaviour at the Criterion Theatre, this year’s motley crew have been released on parole, meaning a third cast will now join the show, including Samson Ajewole (Cooper), Jenna Augen (Ruth Monaghan), Jack Baldwin (Officer Shuck), Leonard Cook (Robin Freeboys), Matt Douglas-Hunt (Mitch Ruscitti) and Peter McGovern (Warren Slax). Continuing their roles as bars-crossed lovers are Samuel Fogell (Sam Monaghan) and Holly Sumpton (Caprice Freeboys), and quite literally completing the cast is Chris Leask (Everyone Else). The understudies will be Jack Whittle, Lydia Fraser, Jean-Luke Worrell, Samuel Thomas and Sarah Gage. 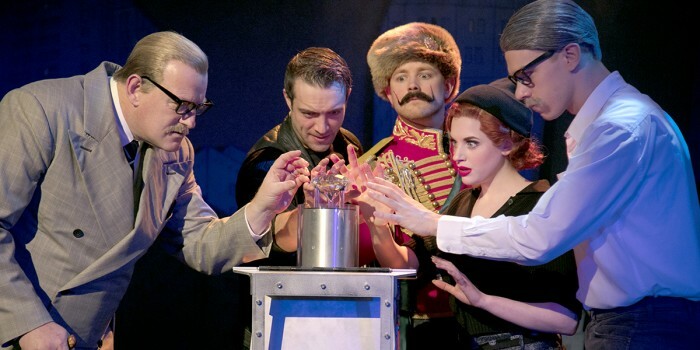 Mischief Theatre’s smash-and-grab hit The Comedy About A Bank Robbery is a fast, fabulous comedy caper, providing rib-tickling laughs in the West End since March 2016. Set in Summer 1958, the Minneapolis City Bank has been entrusted with a priceless diamond. An escaped convict is dead set on pocketing the gem with the help of his screwball sidekick, trickster girlfriend… and the maintenance man. With mistaken identities, love triangles and hidden agendas, even the most reputable can’t be trusted. In a town where everyone’s a crook, who will end up bagging the jewel? Book The Comedy About A Bank Robbery tickets today! The show is also currently participating in our New Year Sale until 9 February.